Wildfire season well underway in the West Western Black Rhinoceros, Gone forever. Bozeman, Mont.—Conservationists are offering a $6,500 reward for information leading to the arrestand conviction of the person(s) responsible for killing a grizzly bear in the Centennial Mountains ofsouthwest Montana last fall. The collar of “Grizzly #726” was recovered from a stream on USDA Sheep Experiment Stationproperty on September 12, 2012. He had been ﬁtted with the radio collar just 18 days before, and thecollar was cut off and hidden in a stream after the bear went missing. The healthy bear that was 3-4years old and weighed nearly 400 pounds, and its last live location put it in the same area as a ﬂock ofgovernment-owned sheep. A spent riﬂe cartridge was recovered from the government sheepherder’scamp, but no one was ever charged with the crime. 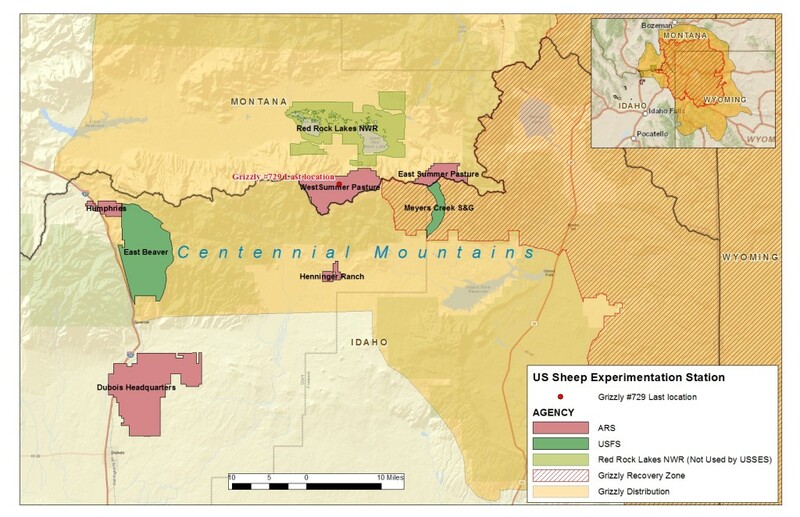 The U.S. Sheep Experiment Station is run by the U.S. Department of Agriculture and grazesapproximately 2,000 sheep on 16,000 acres of land high in Montana’s Centennial mountains.Biologists widely regard the Centennial Mountains as an important travel corridor for threatenedgrizzly bears and other wildlife because the range connects Yellowstone National Park to largewilderness areas in Idaho. Putting sheep in the middle of this corridor has created conﬂict with wildlifepassage. In the past, two entire packs of wolves have been removed by aerial gunning and legholdtraps in retribution for livestock losses on Sheep Station property. Eleven black bears were killed in asingle year on Sheep Station property because of these livestock conﬂicts. On May 17, 2013, Cottonwood Environmental Law Center, Western Watersheds Project, GallatinWildlife Foundation, Native Ecosystems Council and Yellowstone Buffalo Foundation ﬁled a lawsuitin federal district court in Idaho challenging the U.S. Fish and Wildlife Service’s Biological Opinion, which states that “no known grizzly bear mortalities have occurred in or near the action area in therecent past.” However, meeting notes between the FWS and Sheep Station obtained through aFreedom of Information Act request state that within the past eight years, there have been severalgrizzly bear mortalities nearby the Sheep Station, and the determination was made before Grizzly #726was killed. Plaintiffs are asking the court to enjoin grazing in grizzly habitat until the Fish and WildlifeService has completed a new biological opinion that considers all the grizzly deaths in the area. Anyone with information about the killing of Grizzly #726 should contact Montana Fish,Wildlife and Parks at 1(800)Tip-Mont. Callers can remain anonymous and still collect the $6,500 reward upon the successful conviction of the killer. sure get tired of hearing about these types of killings…just like the wolves in Yellowstone …(all collared ) and many more like them. makes me suspicious as to who has access to the radio signal frequencies these animals have on. This can t all be killing from a bunch of ignorant hillbillies. When the wolves were re-introduced, sheepherders and ranchers here in Idaho were given radio collar receivers and the frequencies of wolf collars so they “could avoid known wolf packs”. I observed a Pervian herder (this was at least five years ago)working for the Soulen Sheep Company using radio collar receivers as he moved domestic sheep along West Mountain Road between Donnelly and McCall, Idaho. When I asked the herder if he had located any wolves, he told me he was getting a signal from the mountains to the west of where the sheep were. It doesn’t take a rocket scientist to figure out how to use the receiver to track any radio collared animal in the vicinity. Any high paid ($750/month) Pervian herder could figure it out with a little practice. I do NOT know if radio collar receivers are still routinely passed out to sheep herders and ranchers. The sheep on the experiment station are owned by the University of Idaho. If their herder did kill the grizzly then someone associated with the University was involved with disposing of the dead bear. Someone at the University knows what happed and a little snooping around people involved with the U of I owned sheep should be able to shed some light on who killed the bear and who disposed of it. If the bear was killed and that is an if because no one has found the dead bear how was if disposed of. It appears in the maps that the last sighting of the bear was in O Dell Creek now that does not mean that the bear was killed there. I use to hunting guide in O Dell Creek in 1980. But to dispose of a 400 pound animal it is going take two pack horses/mules (loading a bear on a horse is a trick in it self) and the entails are going to be left behind. Until they find a dead bear, I think that offering a reward is a little premature. The bear disappeared in September of last year and hunters should have found the remains last fall. I certainly don’t know what the access is like here for anything with 4 wheels, but a tractor with a backhoe could dig a very deep hole and bury a carcass that size in about fifteen minutes; an ATV towing a small trailer could transport it out (two+ guys needed to load) and get it to somewhere it could be hauled completely off the property in a pick-up. Then, depending on the resources, a helicopter could just tie on. In those three scenarios – no entrails behind, and a litle creative site work and a hole would be difficult to find, after a little weather; on some ground it is tough to even see an ATV has been around. Suppose somebody should ask what happened to those 11 black bears killed on the site over time. They just leave them on the ground, or did they go away somewhere, possibly by the same means as I suggested? I expect nobody would roll over for $6,500, but make it $25K and there could be a taker. That depends upon where it was killed, if it was killed. If it was killed in O Dell Creek that is a non motorized area. On the Montana side there is only non motorized access except Price Creek. The West Yellowstone game warden, and a cadaver dog from the Park Service could not find any evidence of a dead bear. The empty shell casing could and probably was from last hunting season. We both know that when we start shooting empty cases fly everywhere. Well, being non-motorized is only important if you abide by the law and poachers don’t. A bear, particularly fat one, will decompose rapidly. We may never really know, or find it. You do not know the country one is not going to get in there with motorized vehicles. If it was shot it was shot as an animal of opportunity. Unless some pissed off wife or girlfriend talks the case is not going to be solved and with out a carcass there is no proof of a dead bear. Elk – plug the collar’s UTM into Google Earth — the site is on the Sheep Station’s Montana lands, east of O’Dell Creek. Google Earth shows it as a road, though it may be a pretty marginal one. It does, however, tie in across the divide with the Taylor Creek road system, which seems to be used by Sheep Station quite a bit (it accesses both the east and west summer ranges). I’m pretty sure you could drive a truck in there, or at least get a tractor or UTV in there. How do we know it was even here for long? If you want ghastly, read this. I was appalled. If there’s always one thing you can count on, it’s that there’s always some lowlife who would sell out for any amount of money, so I’m sure there will be takers. Lets not forget folks that there is such a thing as “capture myopothy”. Critters sometimes die, slowly over days or weeks, from the stress of capture, drugs, handling and release. Haven’t they found some wolf collars that were just hidden – one in I, was just tossed into Dworshak Reservoir. Frankly, I think it was the guy(s) who got Jimmy Hoffa. Forty FBI agents, staters and cadaverer dogs, even as late as this week, have been looking for a body. Maybe one needs to be looking in the right place – applies to the bear, too, it would seem. Collar one spot, body could be miles away. Then, again, it could have been aliens that got this bear. The collar was cut off and hidden. That means someone had their hands on the bear in order to take the collar. The bear might have been shot dead, found dead, or tranquilized. Are we to suppose that maybe a bear lover tranquilized the bear and cut the collar so it could wander free and happy? No, there is foul play here of some sort and the disappearance of the carcass is very suspicious it being in a roadless area. Just curious, and maybe more than I should be. Looked at the map provided in the article, and then Google Earth (plus coordinates for collar find location). Is the Sheep Station, SE of Lower Red Rock Lake(South Valley Road) – a big complex at the bend of the road, and bisected by the road? WM – that’s Lakeview & refuge HQ there. I’m pretty sure USSES doesn’t have any facilities in the Centennial Valley. I’d say that’s a cut collar (maybe shears, maybe dull serrated knife). If the bear just slipped the collar or snagged it and tore it off on something, why would it then seem hidden in the creek there? I doubt very much that a USSES sheepherder camp would be someplace it couldn’t be reached by a vehicle. So, where’d the bear go? Bed of truck, or UTV, maybe, then out to the sagebrush. Or, pick it up with a backhoe, tote it off site, bury it. Those sheepherders (who are their own little subculture) have been bragging about killing bears on the sly for years. Might just be bragging, might be partly true. Of course it’s the governments fault, why is a university in charge of herding sheep ? This to on public land, and who gets killed the wildlife ,all for big farmer. After Clinton our wildlife rights has gone to big business, now I am not saying Clinton was all for the people ,far from it. But our wildlife has suffered. Biologists widely regard the Centennial Mountains as an important travel corridor for threatenedgrizzly bears and other wildlife because the range connects Yellowstone National Park to largewilderness areas in Idaho. Putting sheep in the middle of this corridor has created conﬂict with wildlifepassage. In the past, two entire packs of wolves have been removed by aerial gunning and legholdtraps in retribution for livestock losses on Sheep Station property. Eleven black bears were killed in asingle year on Sheep Station property because of these livestock conﬂicts. It does seem odd to stick a sheep station right in the middle of such a predator zone. But that’s humans for ya, top dog staking their claim no matter what. There’s no telling what could have been skulking around this area poaching. O.K. so why did this happen , any conclusions anybody ? Was this to protect the sheep, and the person who did it knew if found they would get into big trouble?. Maybe because of the College being involved, and with tax dollars being given to the College for some kind of scientific research ? What research for the cattle industry, makes me sick to see so much open territory being controlled by a few rich barons. Same old story, like J.P. Morgan, Rockefeller and standard oil ,the rich and powerful, we need another Roosevelt, but I do not see that in the future. We need to stop eating meat is what we need to do. As long as people buy their product, they will exist. The Missoula Independent recently did a long story on the disappearance of this bear. I had missed it. This article goes into more detail than any other I have seen — a good piece of reporting.